There are no air services to Morogoro region. Those arriving by air via Mwalinu Julius Nyerere International Airport (JNIA) can hire a Taxi/Travel Agency to Ubungo Central bus Station for Morogoro bound buses. The most reliable buses are Abood Bus Service, BM Bus, and New Force. One can get mini buses but these are not recommended because of their dangerous high speeds. It takes about 4-5 hours by bus from Dar es Salaam to Morogoro. Upon arrival at Morogoro Bus Terminal (Msamvu), one can hire a taxi for about Tanzanian Shillings (TZS) 7,000/= to SUA main campus. On your arrival at SUA, report to the Office of the Dean of Students (situated in Central Administration Building – Ground Floor Room No. 009). The Dean of Students can be reached by the following number (023) 260 4245 or (023) 260 3411-14 during the working hours. The working hours are from 7.30 a.m. to 3.30 p.m., Monday to Friday. In a very exceptional case, Dean of Students’ mobile number (+255 (0)786 667922) can be used. The enclosed booklet describes the postgraduate programme at SUA. Additional information can be obtained from Head of Department where the candidate intends to register. No services such as accommodation, tuition etc. will be provided before payment of these fees. Please make sure you contact your financial sponsor about this obligation/commitment before you arrive at SUA. Students are either accommodated in the hostels or find their own accommodation outside the campus. Two Hostels (No. 8 and 11) on campus and two flats in town have been reserved for postgraduate students. However due to increased number of postgraduate students, the University can’t accommodate all the students in student’s hostels. Students who do not get a place in the student hostels should stay off-campus. Priority in getting a place in the hostels is given to foreign students and students with health problems. Students who would like to stay in student’s hostel should fill in the enclosed accommodation form “ACC 1” to request for a place in the hostels and should reach the Dean of Students before your arrival. The University has a cafeteria which is commercialized and thus operates on “Pay as You Eat basis”. One can opt to use the Cafeteria or other catering facilities on campus or outside the University. The University has a dedicated Hospital Services Department which runs two health facilities namely SUA Health Centre located at the Main Campus and Mazimbu Hospital located at Solmon Mahlnagu Campus. The two facilities have qualified personnel who attend to the health of the students, academic, technical and administrative staff. Serious medical and surgical cases are referred to Morogoro Referral Hospital or Muhimbili National Hospital in Dar es Salaam. It is advised to have additional health insurance cover. The University has a small bookshop on campus where textbooks and stationery can be purchased. Sports and games activities are organized by the Sports and Culture Committee of the University students Organization and assisted by a Senior Games Coach of the Department of Sports and Games. Various sporting activities are available such as soccer, tracking, netball, basketball, jogging, badminton, weight lifting etc. There are resident Roman Catholic and Protestant Chaplains and an Islam Sheikh at the University who offer religious services. Students and staff have complete freedom of worship within the Tanzanian laws. 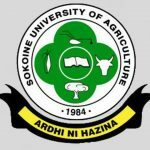 Sokoine University of Agriculture Students Organization (SUASO) is a student Organization to which all students belong. SUASO is concerned with student’s politics, social activities, games and sports and various forms of entertainment. There are also student professional associations such as the Tanzania Association of Agricultural Students (TAAS) affiliated to International Association of Agricultural Students (IAAS), the Tanzania Veterinary Students Association (TVSA) and the Forestry Students Association (FSA). Good conduct during your stay at SUA is very important. On your arrival at SUA you will be given a copy of University Prospectus (where by-laws and regulations governing students at SUA are outlined), Higher Degree Regulations and Guidelines and other documents. Please read them carefully and adhere to them. All Non-Tanzanian students are expected to obtain a visa where applicable, before coming to Tanzania. Furthermore, after reporting to SUA, they will be required to obtain a Residence Permit from the Immigration Office in Morogoro. The office of the Dean of Students will advise and assist to acquire such a permit. There is a charge for this. Upon arrival at SUA you can get more information regarding student life and other available recreational facilities for postgraduate students in the office of the Dean of students. Wishing you every success in your intended programme at our University.